I’m doing my first ever post for Thrift Style Thursday. Hopefully I can keep this up and make it a regular feature. 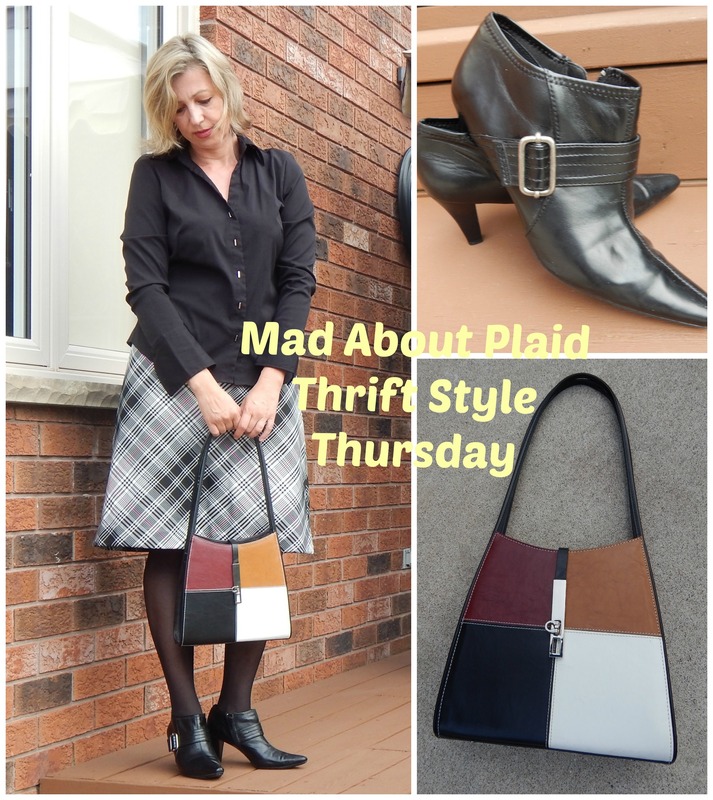 Thrift Style Thursday has a different theme each week where you write a blog post about thrifted outfits you put together. Since it’s my first, I do not have the links for all the other great gals who post their outfits every week. I promise to get that info for next time. This week’s challenge is all about plaid. What comes to mind when you think of plaid? The rolling green hills of Scotland for me – a place I’ve never been to but hope one day to visit and school girl uniforms! The one on the left is just like the high school kilt I wore to my school. Plaid is still big on the runways for fall. Who doesn’t love a soft, oversized plaid shirt or a warm plaid scarf? For this look, I chose a Liz Claiborne skirt that I picked up last winter. It was really, really long when I got it. I shortened the hem but I think it could be a little shorter still. What I like about it is that the plaid is on the diagonal. I’m wearing a black shirt with silver buttons and Nine West booties with tights. I would normally wear long boots with tights (a staple for cold Canadian winters) so this is a little different for me. Besides, it was way too humid today to even dress in long sleeves. I was sweltering. The purse is another thrift find. Not sure the brand but I think it’ll make a good little winter handbag. Once the leaves start changing and there’s a cool crispness to the air, I will be ready. What are your favourite plaid pieces?